To Whom do Artifacts Truly Belong? 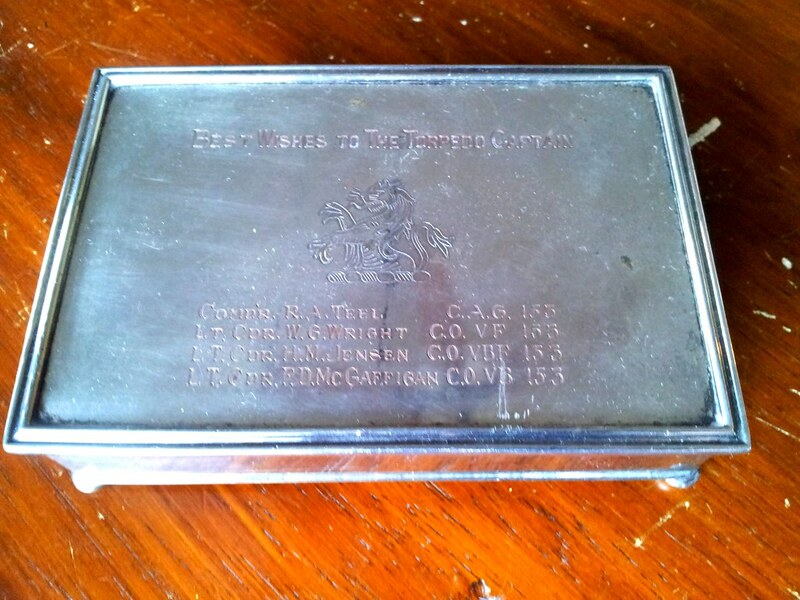 This cigarette box is engraved with the names of four WWII naval aviators (engraved” Best Wishes to The Torpedo Captain”). Though this piece is in my collection, as a collector, I am merely a steward of the history associated with it. Historians, museum curators, historians and collectors all have differing, yet valid answers to the question of historical artifact ownership. Aside from the debate as to where an artifact belongs, there can be difficulties for collectors surrounding rightful ownership that can have more nefarious roots and beginnings. Confederate Major John P. Thompson’s Derringer Pistol Set (image source: PBS/Antiques Road Show). While watching an episode of the popular PBS television program History Detectives, a woman desired to learn more about a boxed set of named (inscribed) mid-19th century Derringer pistols (season 10, “Civil War Derringers, KKK Records & Motown’s Bottom Line”) that her father purchased in the 1970s. 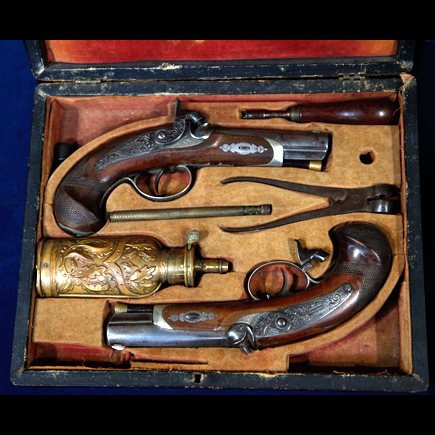 The woman had previously had the Derringer set appraised on another PBS show, Antiques Roadshow (Pittsburgh #1607) for $30,000 but she had no idea who the original owner was or any details surrounding the history of the pistols. Included with the pistol was a document detailing the post Civil War pardon of a Confederate soldier – the name matched the one inscribed on the pistols. The “detective,” Wes Cowan embarked on a quest to learn about the original owner (John P. Thompson) and if he was, in fact, a Civil War veteran and to learn his history if at all possible. The trail that Cowan followed ultimately led to the great, great-granddaughter of John C. Thompson who told the story of her ancestor and how the pistols were stolen from the ancestral home in the 1970s. To whom do these pistols belong? My entrance into militaria collecting began more as a matter of happenstance rather than an active pursuit. Having a passion for local area history and genealogy began for me at an early age. As a child, I would often imagine myself digging up arrowheads or other historical artifacts while digging in the backyard or the adjacent vacant lot. Sparked by my grandfather’s stories of the “Indian Uprising” in present-day Pierce County (the father of his childhood friend told him stories of their family evacuating to the safety of Fort Steilacoom), I would picture myself finding my own piece of history. I never pursued any real archaeological adventures as my focus shifted toward sports and other adolescent activities. After completing my schooling, I was thrust back into history but this time with a military focus when I was assigned to my first ship (following boot camp and my specialty school). I was immersed into the legacy that led to the naming of my (then) soon-to-be commissioned U.S. Navy cruiser. I began to dialog with the veterans of my ship’s namesake predecessors from WWII. From that point on, my interest in military history was truly piqued. This sampling of Third Reich militaria items were passed down to me from my uncle (who served in the U.S. Army MIS/CIC). He sent these peices home from Germany in 1945 having liberated them following the collapse of the Wehrmacht. Collecting, for me, began when I was asked to bring my interests and research skills to bear on some artifacts belonging to my uncle that had been stored for 50 years in my grandparents’ attic. The items were in a few trunks that were unopened since they were packed by my uncle and shipped from Germany in May of 1945. I knew very little about Nazi militaria but was up to the challenge to ascertain value and locate a buyer (my grandparents needed money to help cover their costs of care) for the artifacts. I spent a few months learning about the various uniforms, flags, headgear and badges. Little did I know that I was being immersed into the world of the high-dollar Third Reich collecting (yes, I sold most of the pieces). My uncle served in three wars (WWI, WWII and the Korean War) rising from private to captain. This uniform and bag are from his service with Battery F the 63rd of 36th Coast Artillery Corps. A few years later when I received my maternal grandfather’s uniforms, records, medals, ribbons, etc., I began to understand that while these items are in my possession, they really do not belong to me. I am merely safeguarding and preserving them for posterity. This has become more evident during my search for anything relating to my ancestors who served in previous centuries. I often wonder what became of their militaria. In watching the History detectives episode, my concern for lost family history is decidedly more acute as I have yet to locate a single photo (of my lengthiest pursuit – my 3x great-grandfather who served in the Civil War). In actively pursuing items now in my collection, I have acquired a handful of pieces that have names inscribed or engraved of their original owners. The thought has occurred to me that the potential exists for a descendant to claim rights to anything that bears a name. People fall on hard times or may not possess interest in the military history of their ancestry. A financial need or the desire to free up storage space can drive people to divest themselves of military “junk” without pausing to realize their own connection to that history. In some cases, the heir of militaria may pass away severing ties to the historical narrative thereby devaluing it entirely. While one person (family member “A”) could have inherited an ancestor’s militaria and subsequently opted to sell, another relative (family member “B”) might have not have been provided the opportunity to retain the history within the family. I have seen stories of this scenario playing out where family member “B” notices a post by a collector (in an online militaria forum) about something recently acquired. “B” feels the need to reach out to the collector to restore the item back to the family, often times to the point of accusing the collector of being a party to theft. I can identify with the plight of family member “B” in the desire to regain the lost family artifacts. However, I do respect that militaria collectors are some of the most generous and considerate people. I’ve seen them go out of their way to restore artifacts to the family – sometimes at their own expense. However, I advise that family members should exercise decorum and restraint while not expecting a collector to side with them and relinquish their treasured artifacts. In early 2012, musician Phil Collins published a book detailing his passion for militaria connected to the Alamo and the people who fought and died there. Beginning early in his career, his passion for this infamous siege and battle between the Santa Ana-led Mexican army and a small, armed Republic of Texas unit (led by Lt. Col. William Travis). Collins beautifully displayed his collection across the many pages of his coffee table book, The Alamo and Beyond: A Collector’s Journey. Though his publication was well-received among collectors, it did open the door for a legal challenge to the ownership of several artifacts in his possession. Shown as it was displayed in 1964 at the Smithsonian Institute, the Star Spangled Banner suffered deterioration and damage while in the possession of Major Armistead’s family for over 100 years (image source: Smithsonian Institution Archives). One of the most significant military artifacts now in the possession of the People of the United States is the subject of our National Anthem. 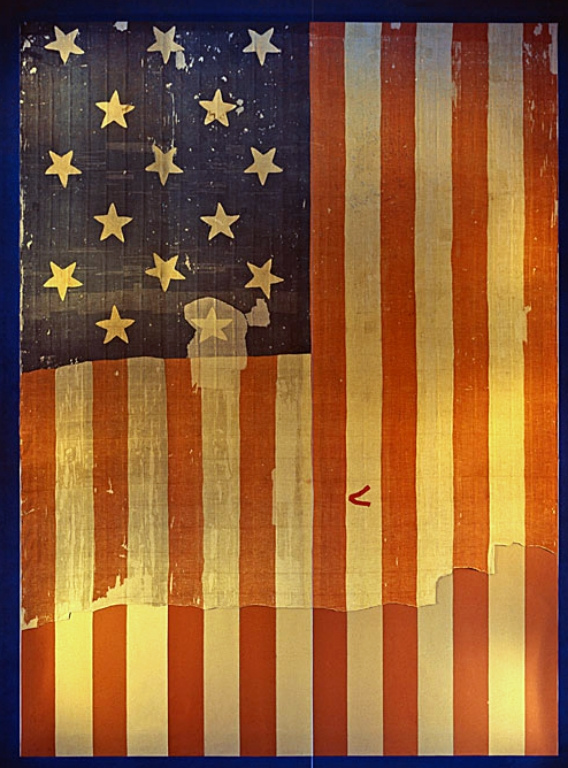 The Star Spangled Banner (the flag flown over Fort McHenry during the September 5-7, 1814 British bombardment) sat in the hands of the Major George Armistead’s (the fort’s commander) family for more than 110 years (with one public display in 1880) before it was donated by his grandson to the Smithsonian Institute. Militaria collectors are merely caretakers and stewards of history. Though we possess these artifacts, ownership is truly not our principal focus. We expend countless resources (time and finances) preserving each piece and researching the associated veteran or historical events in order to preserve the swiftly eroding and priceless history. A Thousand Words? Pictures Are Worth so Much More! Depicting the Massachusetts 54th Infantry Regiment at Fort Wagner, SC, this (2004) painting, “The Old Flag Never Touched the Ground” by Rick Reeves prominently displays the flag leading the troops in battle. Today is Flag Day. On June 14, 1777, Congress passed a resolution to adopt the stars and stripes design for our national flag. In honor of that, I felt compelled to shed some light on how the impact of the flag holds for men and women who serve this country in uniform. Throughout the history of our nation, the Stars and Stripes have had immeasurable meaning to to those serving in uniform. On the field of battle, the Flag has been a rallying point for units as they follow it toward the enemy. From their vantage points, commanding generals are able to observe their troop movements and progress throughout battles by following the flag. Troop reverence for the national ensign was no more apparent during the battle during the early American conflicts (Revolutionary War through the Civil War). Carrying the flag in battle was a considerable honor and the bearer was especially vulnerable to enemy fire. If the color bearer was wounded or killed, the colors would be dropped increasing the potential to demoralize the troops. If the bearer was incapacitated, another soldier would drop his weapon and pick up the flag, continuing to lead the unit toward the enemy. In the 1989 TriStar film Glory (starring Matthew Broderick and Denzel Washington), Private Trip (Washington’s character) prevented the colors from hitting the ground when the flag bearer was shot during the assault on Fort Wagner. At that moment, the troops were mired in the hail of Confederate gun and cannon fire and the Massachusetts 54th Infantry Regiment casualties were piling up. The troops, seeing the flag raised even higher, rose to the occasion and broke through walls of the fort. Though Glory was a fictitious portrayal of actual events, a similar factual event took place in the November 25, 1863 Battle of Missionary Ridge in Tennessee. A young Union officer, 1st Lt. Arthur MacArthur (father of future General Douglas MacArthur) took up the regimental colors, taking it to the crest of Missionary Ridge and planting it for his regiment to see, shouting, “On Wisconsin” rallying the (24th Wisconsin Infantry) regiment. MacArthur, the last in a succession of color bearers (each falling during the assault on the ridge), was awarded the Medal of Honor for this action. USS Grenadier crew member Engineman 1/c James Landrum holds the handmade American flag above a crowd of jubilant Omori Camp prisoners who were being liberated. August, 1945 (source: U.S. Navy photo). Aside from their use on the battlefield, the Stars and Stripes has been known to rally servicemen and women to survive horrific and trying situations and conditions. In the numerous prisoner of war (POW) camps in Japanese-occupied territories and home-islands, American POWs were not permitted to possess a flag. When the Japanese military was on the verge of capitulation, the Americans gathered what materials they could to construct a flag which was captured in a famous image (snapped by an unknown photographer on August 29, 1945) of jubilant POWs celebrating their impending liberation. Though I have seen the image countless times in my life, I never stopped to consider who the men were or what became of the flag. In my own collection, I have managed to maintain a few flag items of significant meaning (at least to me and my shipmates) from the first ship that I served aboard and until recently, I didn’t give them or any other flags a lot of thought. Instead my flags sat in boxes, tucked away for safekeeping. For the Omori POWs, the flag has a meaning that is tenfold more significant than the manufactured, government-issue items I possess. My interest in this Omori POW flag was ignited when the daughter of WWI veteran Electrician’s Mate 3/c Charles Johnson, initiated a thread (on a militaria discussion board) in 2012 with a post detailing her pursuit of a hand-made flag that was made famous in a photograph of the liberation of an Allied POW camp in Japan. Her father was a survivor of the U.S. submarine, USS Grenadier (SS-210) and a POW at the Omori prison camp near Yokohama. Over the course of the ensuing weeks, many helpful replies were submitted by forum members yet no certain leads on the flag were submitted. At the end of September a break in the daughter’s pursuit came when a gentleman submitted a post stating that he was the son of the man holding the flag (Engineman 1/c James D. “Slim” Landrum – USS Grenadier) when the photo of the POWs was taken. The son of Landrum recalled his father’s story of how he attached the handmade flag to a fireman’s pike pole because he wanted the American flag to extend up higher above the others (displayed by the British and Dutch POWs). Afterward, the senior Landrum returned the flag to the fellow POW who supplied the bed sheet. The Jakubielski family presented the flag to the U.S. Navy at Submarine Base in Norwich, Connecticut (Sunday, July 8, 1973) to Admiral Paul J. Early (a noteworthy veteran of the USS Nautilus’ submerged polar ice explorations known as Operation Sunshine) to be preserved for posterity. Subsequent to the gifting of the flag to the U.S. Navy, then-Connecticut senator Abraham A. Ribicoff arranged to have the flag flown over the U.S. Capital in tribute. Though the information helped to close the loop for Charles Johnson’s daughter, the current disposition of the flag remained unknown. My curiosity had been piqued and I was subsequently prompted to reach out to the folks at the Naval Historical and Heritage Command. I requested information regarding the current location of the flag and, if it was in their possession, I asked if it would be photographed and shared within their Flickr photography collection. Several months after contacting them, I received the greatly anticipated affirmative response from the NHHC staff. They did, indeed have the flag within their collection and they had photographed and posted the flag at my request. Purported to be the first American flag to fly over Tokyo, this 48-star flag was made from a white bed sheet and colored with colored pencils by prisoners at Sendai Camp No 11 in Omori Japan. It was flown in August, 1945 (source: collection of Curator Branch: Naval History and Heritage Command). The conclusion to this story (locating the Omori flag), as happy as it may be for some readers, is not always a good one for a handful of collectors. The value in having an artifact of such incredible historical significance in the hands of archivists who will strive to preserve it and share it with the nation is immeasurable. Had the flag landed into a private collection or, worse yet, befallen the fate described by Charles Johnson, the history could have been lost.